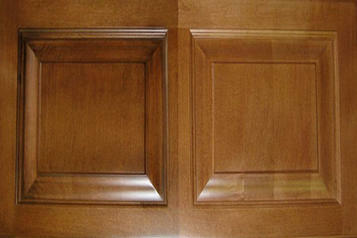 Wood finishes (dye stains, sealers, varnishes...) give a desired appearance and protection. 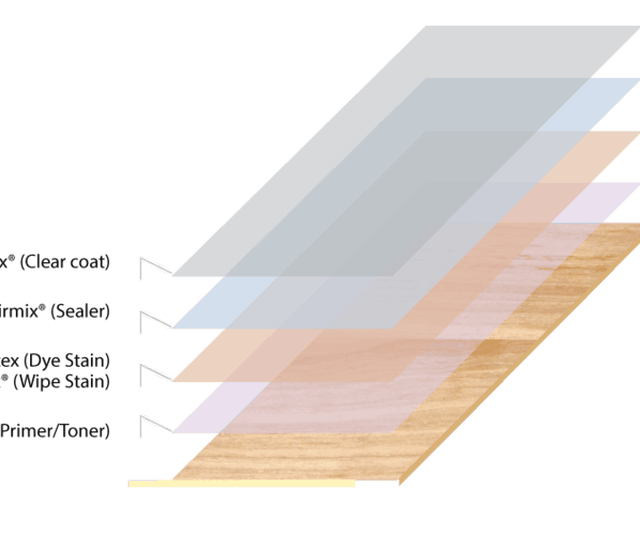 These layers have to be perfectly applied on the wood surface to prevent issues like blotching, haloing, striping, orange peel, and bubbling. We have various solutions available for every coating to help you solve these finishing issues while saving products! Applying stain to wood improves the appearance by highlighting the veins, unifying the tone difference and reducing the risk of color changing over time. 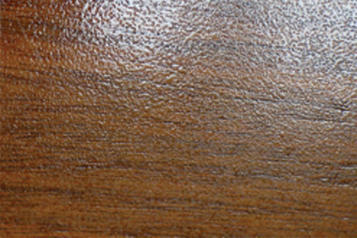 The most popular wood varieties are enhanced with stains. Stain is applied only to solid wood; never to MDF or particle board. Our Airspray product range will deliver the best finishing results possible! How to prevent BLOTCHING EFFECT with dye stains? This issue appears usually on flat surfaces when the stain particles in the spray pattern are not homogeneously dispatched. For manual application: The FPRO Airspray manual spray gun with Restrictor and Vortex. How to prevent HALO effect with dye stains? This issue, which appears in complex-shaped areas such as edges or corners, results from a barrier created by the spray air that prevents the stain particles from covering the edges. How to prevent STRIPING effect with dye stains? This issue appears when the spray pattern is unbalanced. 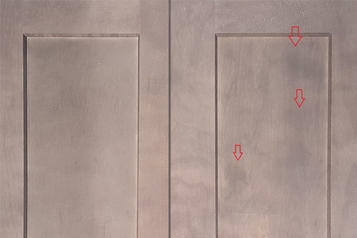 Stain particles are more concentrated in certain areas of the spray pattern which creates a stripe on the part. HOW TO PREVENT COLOR MATCHING ISSUES WITH STAINS? This issue usually comes from a difference in the quantity of stain applied on 2 different parts of a same final product. 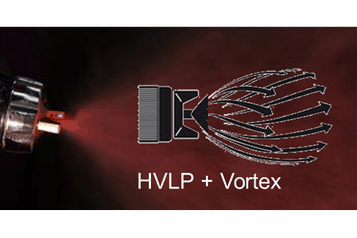 PATENTED AIRSPRAY VORTEX TECHNOLOGY IS THE ANSWER AT SAMES KREMLIN! Applying stains in the WOOD INDUSTRY with pressure airspray guns may lead to blotchy effects that need costly and time consuming reworking! "Shadowing" is a technique used to apply decorative stain by giving an aged appearance. It is the ideal solution for antique-looking wood furniture. After shadows are applied, they are then wiped thoroughly. HOW TO PREVENT A SHADOW EFFECT AFTER WIPING STAINS? This issue comes from an irregular fan pattern resulting from too little or too much stain applied during production. When you need an event layer on solid wood & glossy finishing on MDF, Airmix® technology is particularly recommended for applying clear coat and top coat. Clear coat and top coat need to have certain thinness. In Airspray, you will need too many layers to achieve the film thickness you need and you will loose lots of paint with the overspray. In Airless, you will apply too much paint. 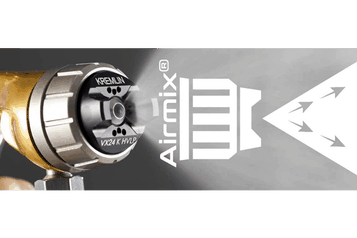 Thanks to the low speed of the paint particle and adding 0.5 bar of air atomization, Airmix® keeps a maximum of solvent on the color particle during spraying. The 0.5 bar additional air accompanies the paint particle to the substrate and prevents air movement around the particle so as to avoid “desolvation.” When you spray clear coat or top coat, the solvent aids in smoothing the paint for a glossy and even finish. The avoidance of ”desolvation” along with our Airmix® technology helps in detering orange peel effects. Primer coats are used between finishing steps to ensure even penetration of stains and finishes, to prevent bleeding of stains and fillers, and to form a good base for the finish. Usually PU, Acrylic, cellulosic, and H2O Primer are used. Only one layer of sealer is needed on solid wood in most cases. This issue is a result of the trapped inside the film build. To apply Primer, we recommend using Airless with Skill technology. 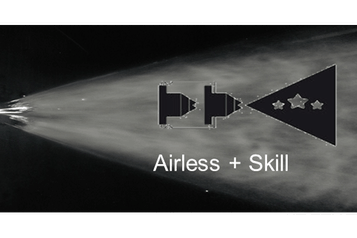 SAMES KREMLIN'S PATENTED AIRLESS SKILL TECHNOLOGY IS THE ANSWER! 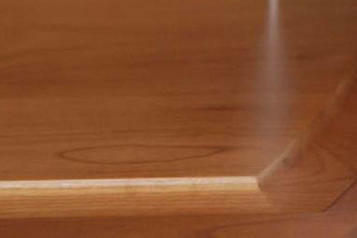 Airless - combined with Skill Tip technology - is recommended for applying UV paint and primer to solid wood & MDF wood. When you spray UV paint, the addition of air atomization will create bubbling in the film build during the application. Compared to a classical Airless application, the Skill Tip technology uses half of the pressure to apply the paint particles, thus limiting desolvation. 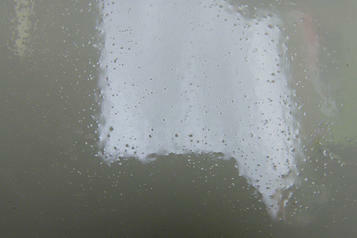 Bubbling is avoided and a premium finishing quality is achieved. When you spray Primer, you need to build a certain amount of layers before sanding. The low paint speed of the Skill Tip technology, when compared to a classical Airless, leads to less overspray and a closer spray proximity to the substrate. This results in a better transfer efficiency and a thicker film build. A varnish is applied for cosmetic (gloss, mat) and/or protective (dust, pollution, ultraviolet) purposes to form a colorless, solid film build. Most of the time, varnish is used as the final layer on solid wood. Varnish is transparent and can be applied in one layer. HOW TO PREVENT ORANGE PEEL EFFECT FOR VARNISHES? This issue appears when there is either too much air added to the spray pattern or too much product applied in one layer on the part. Chervin Kitchen & Bath has been using SAMES KREMLIN FPro airspray spray gun and comments about the great results they were able to achieve in terms of spraying quality and cost savings for their manufacturing process.